In an attempt to replace my iPhone 5S charging port today, I got through nearly all the steps on the iFixit guide only to realize that I purchased the wrong charging port (i.e. lightning connector) on Amazon. On the bright side, I’ve learned a little bit about the differences between the parts, whatever that’s worth. The iPhone 5S charging port is Part #821-1596-A. The iPhone 5 charging port is Part #821-1417-A. The replacement procedure is a bit tedious, requiring the removal of around 20 tiny screws which range in size, but I’ve decided to undergo the repair myself to save money. Apple insisted on $269 to replace my iPhone when I brought this issue up to them at the International Plaza Apple Store in Tampa, FL. They would not budge, even though an inspection of the inside of the phone showed no water damage. Considering that the lightning connector part costs only ~$7.50 on Amazon, a $269 fee to address this at the Apple Store is quite outrageous. Here are the parts I purchased on Amazon. 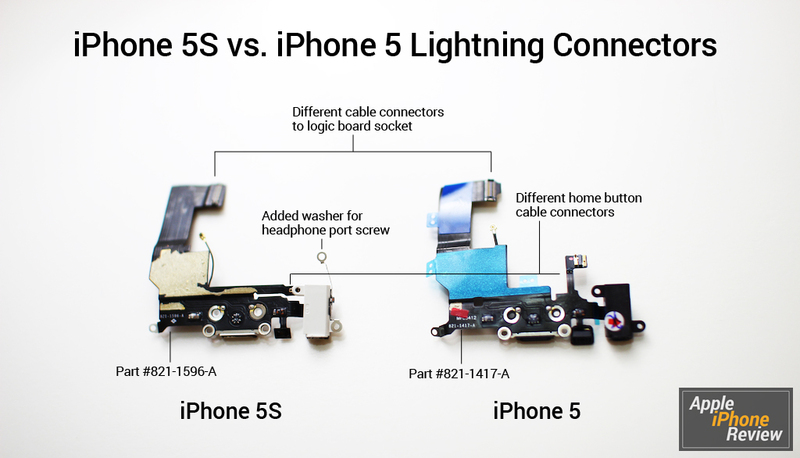 If you need this part, be careful to buy the right model — iPhone 5 and 5S lightning connectors are different parts, as you can see above, and one will not work on the other. After the mixup, I purchased the correct part from Amazon and will report back on the charging port repair in an upcoming post.